Regardless of how much you sweat and how active you are, everyone needs deodorant. Sweating is just your body's natural way of releasing excess heat and moisture. However, there is nothing worse than finding yourself on a hot, sweaty day with no deodorant. On a particularly stressful day, during hot weather, or after an exercise class, you’ll really wish you had a quality deodorant on your side. The trick to feeling cool and confident all day is in finding the right deodorant to meet your personal hygiene needs, as well as something that you like the smell of. We have covered some of the best deodorants for women so that you can find the perfect antiperspirant in no time. Deodorant is a personal hygiene product that controls sweat and odor, while helping to prevent further unpleasant odors. It typically comes in a roll-on, gel, stick, or body spray applicator. You can find them in all different scents and some deodorants even offer additional benefits. According to an assistant professor of dermatology at USC, it’s best to switch up your deodorant brand every six months because your body can become immune to the ingredients in your deodorant. There are a number of unisex products that both men and women can use, but deodorant shouldn’t be one of them. You’ll want to choose a deodorant that has been designed for a woman, so it can meet your needs, while still smelling fresh and feminine. As Amazon’s #1 best seller in deodorants, the Secret Deodorant Shower Fresh Solid twin pack offers a great value. The affordable solid stick deodorant is pH balanced to work with your body’s chemistry. The invisible solid stick goes on dry and offers invisible odor and wetness protection throughout the day, no matter how active you may be. The shower fresh scent will also leave you feeling fresh and clean throughout the day. 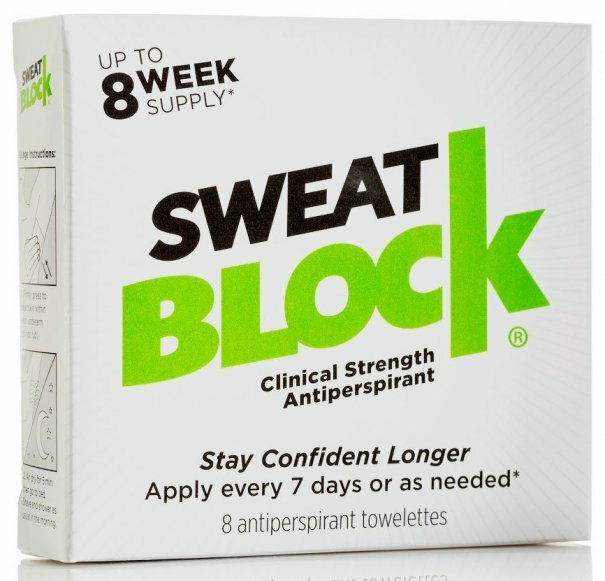 As Amazon’s #1 best seller in antiperspirants, SweatBlock Antiperspirant Clinical Strength can control sweat for up to seven days per use. Each box includes eight antiperspirant towelettes, keeping you fresh for eight weeks. All you need to do is blot the pre-moistened towelettes under your arm once per week, before going to bed, and let the SweatBlock go to work. It goes on clear and won’t stain your skin or clothes. It is strong, yet safe enough to use on any area of the body where you would like to control sweating, such as on the feet, face, neck, back, and legs. The doctor recommended, clinical strength antiperspirant can safely, effectively treat excess sweating and hyperhidrosis, so you can feel confident for longer. Most reviewers also reported less burning and itching than with other antiperspirants. While many reviewers reported that the alcohol-free towelettes are enough to battle sweat and body odors, others found that it worked best to use this in combination with regular deodorant. Even people who felt that they had tried everything found life-changing results with SweatBlock. It has been featured on a number of publications and television programs, such as The Rachael Ray Show. It is also backed by 1,600+ 5-star ratings on Amazon and has a 30-day money-back guarantee for your added peace of mind. The four-pack of Mitchum Antiperspirant & Deodorant for Women, Power Gel is clinically proven to combat wetness and odors all day. The quick-drying gel formula goes on smoothly and won’t leave any residue on your skin or clothes. The oxygen odor control technology releases pure oxygen to naturally fight odors caused by bacteria. The alcohol-free formula won’t sting or burn your sensitive skin and the Powder Fresh scent will keep you smelling great for 48 hours. Both the men’s and women’s versions are award-winning selections that are backed by outstanding reviews by consumers and independent review sites alike. ConsumerSearch, Real Simple, and TotalBeauty also chose it as one of the best deodorants for women. Dove Go Sleeveless Beauty Finish Deodorant reduces odor and wetness for 24 hours, keeping you dry and comfortable throughout the day. The formula goes on clear, and will stay on your skin, not on your clothes. This gentle, moisturizing stick deodorant is ideal for sensitive skin and can even help reduce the appearance of bumps and discoloration under your arms. In just five days, your underarms will feel softer and smoother thinks to 1/4 moisturizers and vitamins E and F.
Dove is also dermatologist recommended for skincare, so you can feel confident using it on freshly-shaven sensitive skin. Chosen as one of the best deodorants by ConsumerSearch and AllWomenStalk, it is available in a range of soft, feminine scents. 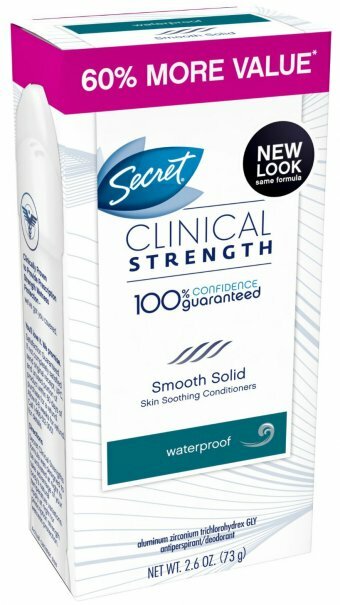 If you’re prone to excess sweating, then Secret Clinical Strength Smooth Solid Women's Antiperspirant & Deodorant Waterproof All Day Fresh Scent is the perfect solid deodorant stick for you. Thanks to its waterproof properties, you can wear this even on a day of swimming. Used at bedtime, it offers prescription strength wetness protection for 48 hours, up to 4x the stress sweat protection of an ordinary antiperspirant. Enriched with skin conditioners, it will leave your underarms feeling softer and smoother. The doctor recommended waterproof deodorant contains odor fighting molecules that will absorb odor, no matter how active you may be, to produce a fresh scent and dryness that lasts all day. In fact, it is 100% guaranteed for your added peace of mind. It is also an award-winning choice that has been recognized by publications, dermatologists, reviewers, and online review sites since 2008. It was also chosen as one of the best deodorants by ConsumerSearch and Real Simple, and is available in 10 different scents to best suit your needs. And those are our recommendations for the best deodorants for women. As always, be sure to check Wise Bread's Buying Calendar to learn when and how to buy just about anything! Just about any product "for women" costs more than the same product for men. I use a good men's deodorant, preferably unscented, such as Arm & Hammer Essentials Solid Deodorant or Speed Stick Power Antiperspirant/Deodorant, which can be purchased for $4 or less per stick. I live with two men, husband and son, so this simplifies shopping and saves money. I don't risk it with anything but Lavilin. It is all-natural and long-lasting, and it works incredibly well.